Sam and Kathryn both share a love for travel and this was to be the theme for the wedding. 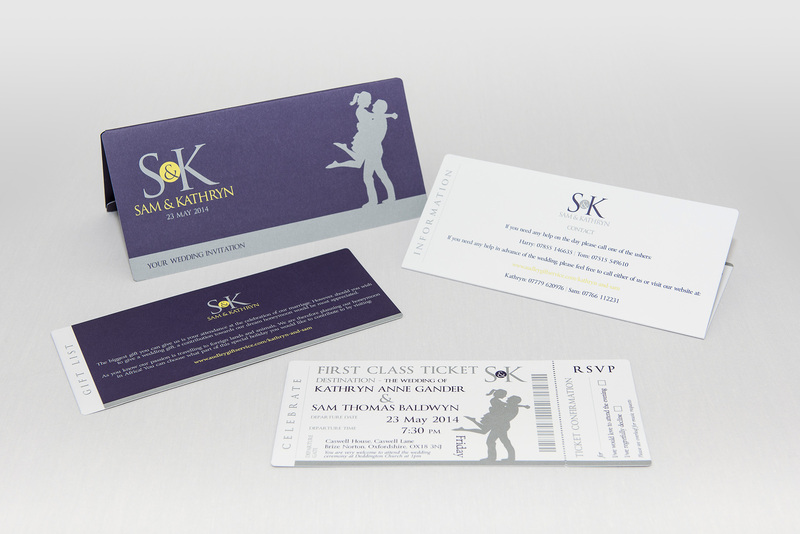 Kathryn had the idea of having their stationery being designed like an old school set of travel cards but with a contemporary and modern feel. Purple and yellow/green would also feature in the wedding with the bridesmaids dresses being purple and Lillies being prominent throughout the flowers. The design that I came up with was a bespoke card wallet that housed several ‘tickets’ or cards. These included the invitation to the wedding (both day and evening), the gift service and directions/FAQ’s. For the invitations, a tear off slip was part of the card (much like on a flight card) that the invited guests would tear off to RSVP and return with their dietary requirements on the back. In addition, an order of service cover was designed as well as place names that resembled baggage tags, all bespoke made and branded with Sam and Kathryn’s logo that I designed for their big day.